Insanely Sharp Focus! Extreme Pre-Workout Formula! Intense Energy, No Crash! Insanely Sharp Focus! Extreme Pre-Workout Formula! Intense Energy, No Crash!Insanely Sharp Focus! Extreme Pre-Workout Formula! Intense Energy, No Crash! 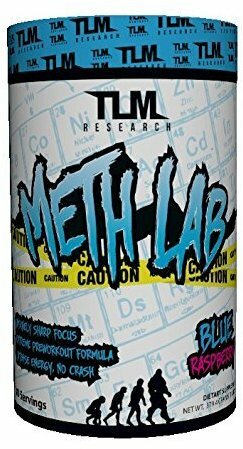 Introducing Meth Lab by TLM Research: the best, hardest-hitting, no crash pre workout on the market today. So many companies these days come out with cheap, under dosed energy pre workouts that feel like they’re working but in reality aren’t doing anything but making you bounce off the walls, followed by a hard crash. Have you ever taken the “latest and greatest” pre workout, only to feel over stimulated and exhausted afterwards? I know most of us have. That’s why we set out to make a better pre workout. Here at TLM Research we want to give you products that work. To start out we put 5 grams of creatine monohydrate. Creatine monohydrate is the most studied, most effective form of creatine. Your muscles need creatine to perform at a high level. With 5 grams per day you will provide your muscles with the fuel they need.Next we put 350 mg of caffeine- because c’mon, Meth Lab is all about giving you the energy you need to get you through those hard workouts. We also added 2 very unique ingredients to Meth Lab- Higenamine and Theobromine. Higenamine is a fat burner and bronchodilator similar to ephedrine. This means that you will have increased endurance and you’ll also sweat more during your workouts. Theobromine is a stimulant like caffeine, but it dilates your blood vessels. This means more nutrients will be delivered to your muscles and you won’t feel a crash afterwards- a typical side effect of caffeine. To top it all off we added B3, Taurine, beta alanine, and beet root With this combination of ingredients you’ll not only have awesome energy but you’ll have mental focus like no other! So, who should take Meth Lab? Anyone who needs an extra boost of energy and mental focus- whether that is in the gym, on the field or even a long day at work. Stack Meth Lab with Blood Bath and not only will you have insane energy and mental focus but you’ll be pumped out of your mind! When should you take Meth Lab? It is recommended to be taken 20-30 minutes prior to exercise for increased energy, mental focus, and athletic performance. Other pre workouts on the market leave you wanting more. With under dosed ingredients you have to take 2 or even 3 scoops to get that boost of energy you’re looking for. But not with Meth Lab. One scoop is all you need! The wait is up. TLM Research Meth Lab is here and it’s here to stay. So, who should take Meth Lab?So, who should take Meth Lab? When should you take Meth Lab? When should you take Meth Lab?